Well, I finally picked myself up a super tidy V3 STi after driving a people mover for the best part of four years. It has an exhaust and intake but other than that she's fairly stock, and straight. I'm after recommendations from you guys and girls regarding (the next) performance upgrades I should be looking into and recommendations on who should do the work. One name I have seen around here a little bit is Possum Bourne Motorsport. 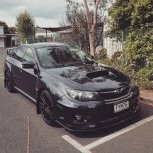 I would be keen to hear of your experiences, good and bad, at tuning shops around Auckland and your best 'bang for buck' performance upgrades that you would recommend for my stock-ish WRX STi. No personal experience with Possum Bourne Motorsport but see good things on FB, When it comes to getting a tune D-Tech in Tauranga are ace. If its stock you will be rocking a VF23 iirc which is capable of creating good usable street power. just add breathing mods, it wants to get air easy and get it out easy. Some of the D-Tech staff are on here I think. PBMS are also good but a little more expensive usually. 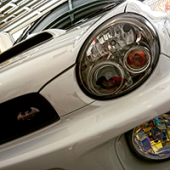 E&H Motors (across the road from PBMS) in Pukekohe are good, they did my V3 Sti. Quick turn around and good quality of work. Also will recommend D-Tech. Tunes are SIGNIFICANTLY cheaper than PBMS when you're talking something like a Flex Fuel tune.. about $700 difference..
You guys are legit - thank you so much for the comments. It sounds like I need to give D-Tech a call. I gather there are different types of tunes for different purposes, would that be correct? What is a Flex Fuel tune? have minimal experience with performance tyres. Stock fuel pumps no good? Does the IAT go on the manifold or where? Does I need to fabricate something to fit? Will the rear sway bar keep the nose straight will it? That you're right about. Flex Fuel tunes are used in conjunction with a flex fuel sensor, which senses ethanol content. This is incase you're wanting to run Normal say 98 fuel and also run E85 etc so you don't need to worry about possibly popping a motor due to too much or too little of X fuel type in your tank to be on say your 98 tune or e85 tune. Chances are the pumps old as f*ck and they dont handle the extra pressure well. Best bet is to upgrade just call it preventative maintenance. The IAT goes within 6" of the throttle body on the turbo side. If youre running tmic just tap a hole for it in the tb end tank so its post core. Yep stops the horrible understeer effect subaru are so famous for. I dont think they need the business tbh. Busy enough as is and our type are the C***iest customers. Great articles man - cheers for sharing. I definitely have a better idea of what I want to do. Think I need to really get familiar with the motor too. So I just took her for a 'real' drive yesterday - tried to keep up with a 1 litre bike through the back of Waimauku all the way to Hellensville. It was one hell of a drive. But I noticed myself forever trying to keep the car in the corner. As in, the power was fine, I'm happy with it, but what's power when you can't even corner properly. She was all over the place and I felt the rear slide out once or twice (is that over or under steer?). Also, the body was bottoming out on the tyres but I did see an invoice for guard rolling in the glove box. There must be any number of reasons that the body was hitting the tyres I'm assuming? Brakes started to get hot after this back street race so had to chill on the drive home. But wow - what a car. Thank you! I have read. As I was mentioning above, handling was challenge - I wander if old shock were contributing to the poor handling or the bottoming out on the tyres? Would this be considered an upgrade to my, presumably stock, dampers? How many beers are we talking? Also have a factory rear swaybar for a v7 sti if you want it, with end links. Dont know if it'll fit a bc but its there if you want it. Took mine for a good thrashing today, and the uprated rear bar with the factory front bar is an odd feeling. Like, you can feel the front roll around but the rear sits solidly on the road. Sounds like you know where the shortcomings are, i'd be getting some new struts, full fluids change with new pads and rotors, do your clutch fluid too. Get some new sticky tyres on to it (re003 or similar)Start hunting around for suspension goodies, rear swaybar, front swaybar, endlinks, anti lift caster correction bushes and a good alignment. @kwi_fozze you drunk brah its v3 sti. I find my gc8 a bit wallowy compared to the gf8 with 22mm rear bar. Havent had a chance to tax it since the alignment so not sure what will happen when i stick it in nailed. Excuse my ignorance but, I presume that those dampers would be an upgrade? Is the v7 factory rear sway bar thicker than what I have? I haven't actually put calipers on it to measure. I did see a Whiteline 22mm for sale on Trademe so it's good to hear that when you fitted yours it was in fact a more solid rear. Would hate to 'upgrade' it only for it to feel the same. I did some inspecting over the weekend and all the fluids look brand new and in really good condition to be honest. The brake pads have heaps of meat on them but I couldn't see what brand they were. It would be nice to get slotted rotors all round - that would really give me some more bite and hopefully keep them slightly cooler under load. When fitting a new sway bar is it recommended to upgrade the end links too? Is it a necessity or a recommendation and what benefit do I get from this? I'm really interested in an anti-lift kit. I suppose to some degree it's preventative maintenance too? I've also looked into a rear strut brace but I'm not to certain of the actual benefit of this? Would I need an adjustable one, if there even is such a thing, so that I can increase/decrease torsion? Anti lift kit is the 2nd most noticable mod i've done, totally changes the front end geometry. 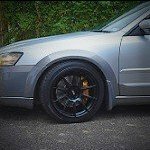 The struts, not an upgrade per-se, more along the lines of "best replacement strut available in nz at a reasonable price, that isnt platform adjustible." They are ok, little bit more of a touring strut, they arent valved as agressively as the v7 sti inverted struts so not as harsh. Endlinks, your call. Did em on my car because of the age of them (nearly 300k on factory links) so couldnt say for sure. Rear strut brace. Worth if its a wagon, much of a muchness if sedan as they are pretty stiff anyways. What was the most noticeable mod? I figured the anti-lift kit would make a huge difference, along with an upgraded rear sway bar. Would I need a front sway bar upgrade with the anti-lift kit though? I don't think the anti-lift kit is something I could tackle myself. Who did yours? v7 inverted struts sound fancy - I don't know what the inverted term means so I'll research it. My thoughts too on the rear strut brace. Oh and I had a look at that facebook link you sent through - those are some really nice bits but what the hell is a k-brace?